Can you still get bread sliced to order? Before the war grocery stores had adjustable bread slicing machines and would upon request slice your loaf either for toast or dainty cucumber sandwiches' but today although bread slicing is still available you get no choice of thickness. This is maybe only in the UK do other countries have high tech machines ? Re: Can you still get bread sliced to order? It's the best thing since sliced bread. What did they say before the automatic bread slicer? I am not too fussy when it comes to most things so I take my bread in its thick or medium sliced format. Buying the unsliced loaf and slicing to suit with a black n decker or electrical carving knife is always an option. I am thinking this is more a cultural quite interested question rather than a bread thickness solution you need so I will postulate yes you can get this at bakers somewhere in the world. keep on slicing brothers n sisters. Panera Bread (St. Louis Bread Company) will sell you unsliced loaves of bread, or on request slice them, but I don't believe there are any options on slice thickness. For beagles, one has 3 choices. Unsliced, halved, or "bread sliced". I could imagine that most people would choose either thick or thin sliced, so if a bakery wanted to give an option for heavy duty slices, they might be able to get away with having 2 machines with different sizes of slices. 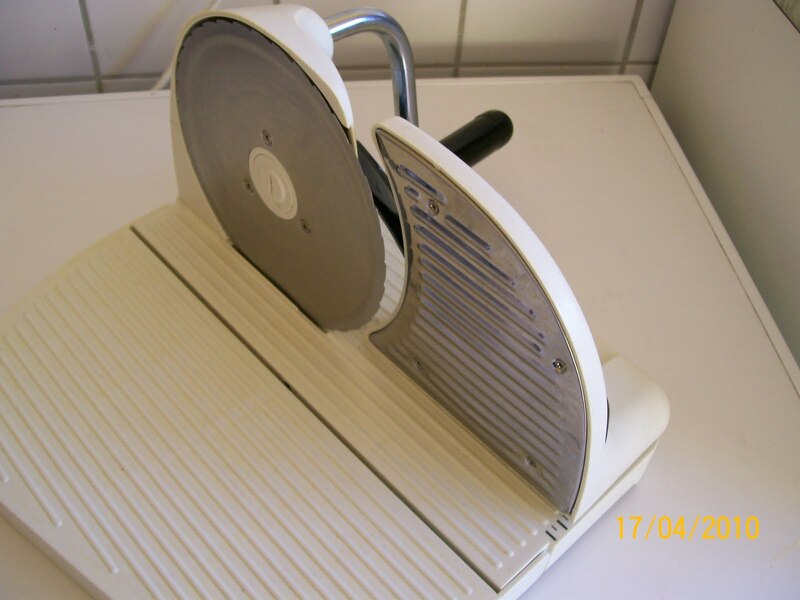 It would be easy enough to build a bread slicing machine with springs between the blades (and possibly a locking mechanism), so it would have infinite adjustment, but I doubt it would be useful. Perhaps you would be best off with quick change blade sets at 1/2", 3/4", and 1". I wonder what the most desirable thickness would be. Some toasters are made to accept thick slices, especially after bread machines became popular, and some people were making home-baked bread. We are fortunate to have an independant baker just a few minutes walk away, who has been awarded best baker in Kent on many occasions. The daily queue outside the door is a testament to their quality. Their bread is unsliced, but they will slice it for you when asked, however there is no option on the thickness, its thick sliced only. I would say this makes good business sense. Better to sell a 450gm loaf in 15 slices than in 20 or 25 slices, also better to have to invest in just one slicer than two or three, or a more expensive adjustable slicer. And its not just the cost of the slicer, its also the space they take up, which would be better devoted to production or sales areas. Then there would be the cost of regular maintenance of three machines as opposed to just one. A machine with adjustable blades might be a devil of a job to keep clean. In these days of over-enthusiastic health & safety regulations, an adjustable machine, I can imagin, might prove more trouble than it is worth. Aslo to be considered, is the fact that we are now a more effluent affluent society. (Probably both, as it happens). So we might be deemed to more able to afford thicker sliced bread than in the past, when many 'working class' families had to make food go further. Lastly, while the mass produced pre-packaged, off the shelf bread can withstand thin slicing and still not crumble when being spread with butter, fresh baked bread, without the addatives of the mass produced bread, tends not to be quite so robust, so it is harder to spread with butter, jam (jelly), peanut butter, Marmite etc when thin or medium sliced, resulting in not so much sandwich or slice, as crumble. The daily queue outside the door is a testament to their quality. Their bread is unsliced, but they will slice it for you when asked, however there is no option on the thickness, its thick sliced only. Now, if they only had 2 bread slicing machines, the line might be half as long, and not causing congestion on the sidewalks. I will be in Indianapolis next month and check out what is available, adjustable thickness slicing machines are not unduly complex and as I recall they were also used for ham etc although this was probably not all that hygienic . Meat is often sliced one slice at a time. At least the bread slicers used by Panera slices the whole loaf at once. The two designs may be quite different. My local Morrison store had some special offer toast thickness loaves for £0.50 ($0.75) today who needs slicing machines ? Yuk! I would hope that you meant bagels (bread rolls) rather than beagles (breed of dog)! I asked at a bread shop in Melbourne (Australia) this morning; they have a bread slicing machine - one side of the machine does "thick" slices, and the other side does "thin" slices. I guess if you put the loaf in the middle, it could do half-and-half? It can indeed! I also live in Melbourne, and I can assure you that half thick and half thin loaves are very popular! (most people eat both sandwiches and toast). Have only ever seen pre-sliced ones though. Could H.A.A.R.P. be used to "pierce" inversion caps, in order to release smog? Why does fermentation time affect the taste of bread?